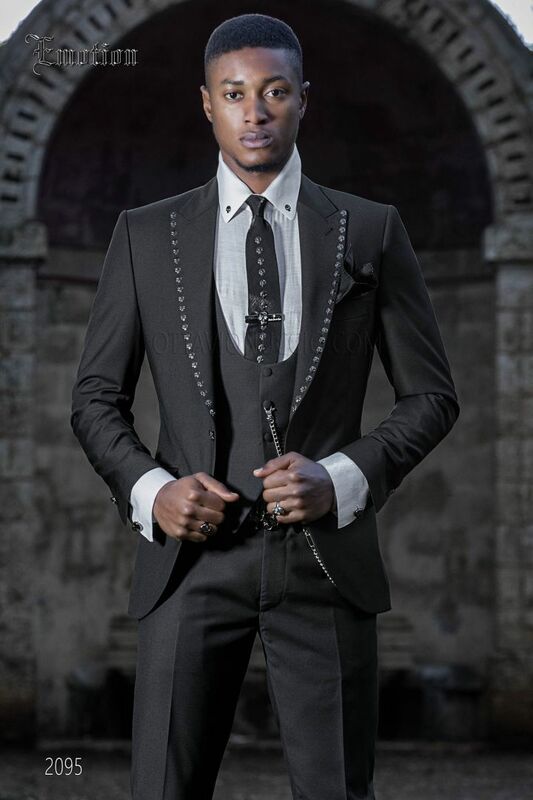 Black wedding suit for groom with appliqués. Peak lapel with single patterned button closure. Smoky grey diamante appliq... Black wedding suit for groom with appliqués. Peak lapel with single patterned button closure. Smoky grey diamante appliqué on the lapel and flap pockets with angled buttonholes. Single patterned button and angled buttonholes at cuffs. Single vent at back, rounded finish to stylize the figure and tail of jacket suitable for any height. Vest made from a black wool blend with 4 buttons closure. ATTENTION: new version of the vest has 3 buttons. Shirt made from white lurex with 'Emotion' collar. Black skull appliqués on the collar and placket. Concealed placket wi... Shirt made from white lurex with 'Emotion' collar. Black skull appliqués on the collar and placket. Concealed placket with buttons. Straight cuffs with skull-shaped cufflinks. Tie made from black lurex with black skulls appliqués. Matching handkerchief. Handmade. Slippers made from black patent leather with black and silver-tone 'ON' embroidery.